"Describes an eight-day Mayan Indian fiesta in Tenejapa, Mexico held in honor of one of the town's patron saints, St. James. Narration consists of the participants own explanation of events, translated into English." Cancian, Frank. 1965. Economics and Prestige in a Maya Community: The Religious Cargo System in Zinacanton. Stanford. Collier, John, Jr. 1968. American Anthropologist 70:1050-1051. Pozas, Ricardo. 1969. 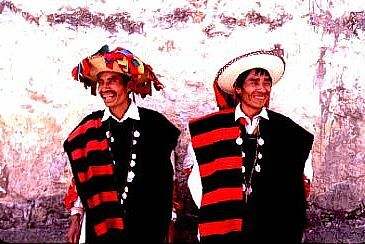 Juan the Chamula: An Ethnological Re-creation of the Life of a Mexican Indian. Berkeley: University of California Press. Vogt, Evon Z. 1969. "Cargo Rituals I" and "Cargo Rituals II" in Zinacantan: A Maya Community in the Highlands of Chiapss. Cambridge: Haravard University Press. Vogt, Evon Z. 1970. The Zinacantecos of Mexico : A Modern Maya Way of Life. NY: Holt, Rinehart and Winston.